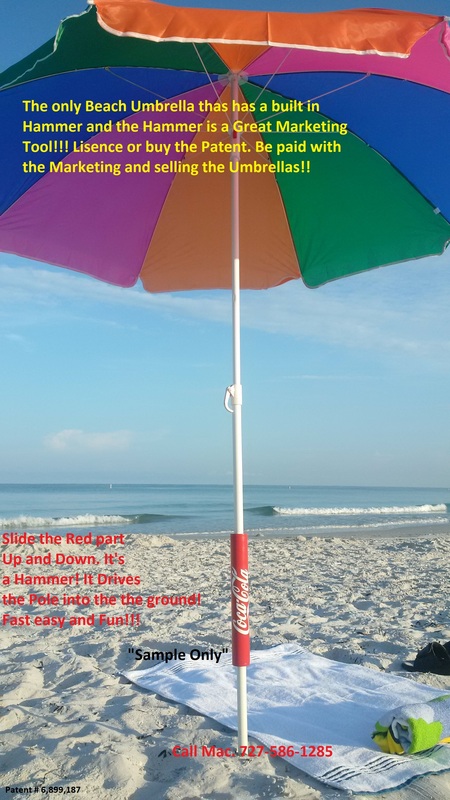 Put up a beach umbrella with ease! THE UMBRELLA YOU CAN PUT UP ANYWHERE!!! 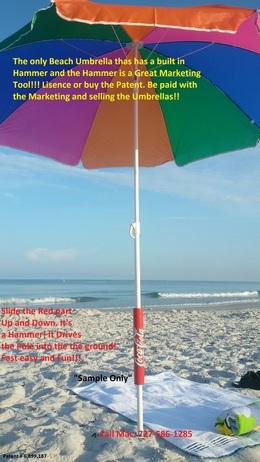 A Patented New Beach Umbrella!!! An Easy Umbrella that you can put up Anywhere!!! Have you ever tried to put a beach umbrella into the sand? THE RED PART IS A SLIDING HAMMER!!! SIMPLY SLIDE IT UP AND DOWN, AND IT DRIVES THE POLE INTO THE GROUND!! How about your lawn or any grassy area. Well, it's Simple and Fun now! Watch the video I have and look at the pics and Flyers. This also CREATES a new area for Advertising! On the Slide itself. You can also make real estate signs, yard signs, police tape holders, volley ball net poles..etc. I can put up 7 to 10 of these in the Grass before you can put one in the sand! Let me know if you may be interested in purchasing the patent. Umbrellas already Sell. This makes it better. . .and it Works! This is also a multi-product patent, other uses are: Real Estate sign, Yard signs, For Sale signs, Police tape holders, and Utility Umbrellas (Road work and Construction sites). A Patented New Beach Umbrella!!! An Easy Umbrella that you can put up Anywhere!!! Options for you: Invest to start manufacturing with a warehouse and become a Partner, or, Buy a license agreement of your own. Or if you have other ideas please let me know! Have you ever tried to put a beach umbrella into the sand? THE RED PART IS A SLIDING HAMMER!!! SIMPLY SLIDE IT UP AND DOWN, AND IT DRIVES THE POLE INTO THE GROUND!! How about your lawn or any grassy area. Well, it's Simple and Fun now! Watch the video I have and look at the pics and Flyers. This also CREATES a new area for Advertising! On the Slide itself. You can also make real estate signs, yard signs, police tape holders, volley ball net poles..etc.